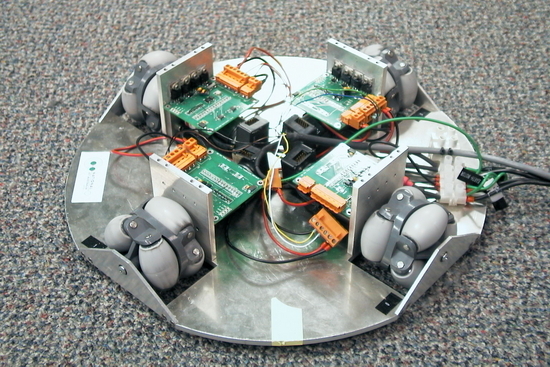 Before the design of the InsectBot, there was the Burpbot, which was founded and lead by Dr. David Austin and Dr. Nick Barnes. 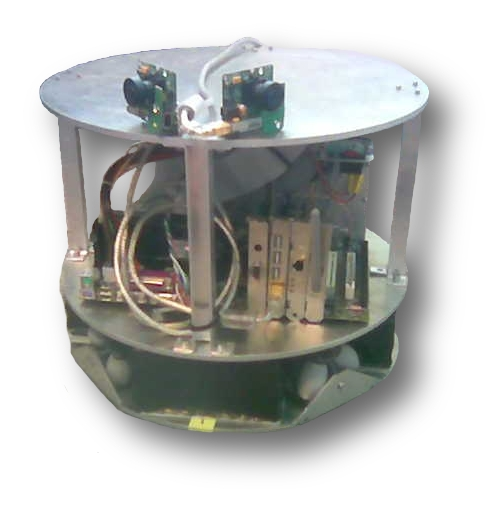 It was developmented on a part-time basis under the "Ubiquitous Robot Project Proposal". Joystick C program development for local and/or remote control over UDP. Open-loop motor controller C program development. Parallel Port PWM/Encoder Linux Kernel Driver re-write. Linux (Ubuntu) OS and drivers (Firewall, Wifi) management. Motor Controller design, testing and soldering. Mechanical Pro Engineer computer modelling. Motor Controller soldering of earlier versions. Parallel Port PWM/Encoder Linux Kernel Driver initial development. New computer (Mini-ITX VIA EPIA) setup, mounted and installed. New drive control circuits designed and installed (our latest drive controller seems to be very robust, supporting up to 50V at 20A, if required). Circuits designed such as a power supply and interfaces to reduce wiring. 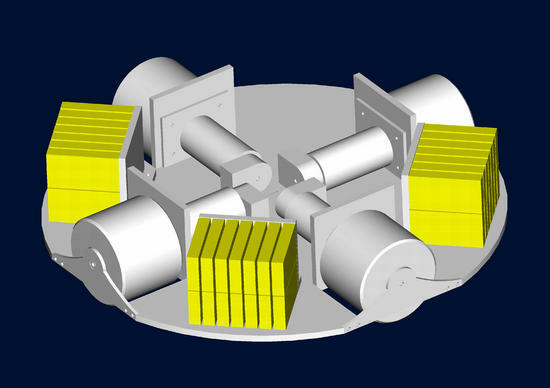 The current design has some nice design features such as no gear boxes, which means almost zero power is required to move the robot, once it is already moving. However to provide possible future research requirement loads such as active vision systems, laser range finders and longer run-times a mechanical re-design is on the cards. More wireless drive system tests were performed, to demostrate the primary mechanical drive system must be redesigned to provide a robust, extendable and efficient mobile robot that can support our potential load and run-time requirements. Parallel Port open-loop drive control integrated. Battery packs built and installed. Computer (ATX-style) setup, mounted and installed. Firewire fish-eye cameras mounted and installed. USB2.0 drive control integrated (closed-loop control needs work). Some control software written. Wireless open-loop drive control tests using a side-wider joystick, which sent motor speeds as UDP packets, and ssh forwarding was simply used to view a single camera input, all over wireless ethernet 802.11g. If you are a robotic hobbiest you will be very much interested in the Parallel Port PWM/Encoder Linux Driver developed in February, 2005. This ("poor-mans") driver will allow you to control high voltage motors very cheaply. Electronic development of drive control, sensory and computer I/O interface circuits. Base level assembly. Numerous control software written. Speed tests of base level performed via tethered power supply and control. With no load the top speed was found was 2.5m/s. Project proposal and acceptance. Base level mechanical and electrical design and computer modelling. December, 2003 - Ubiquitous Robot Project Proposal. February, 2004 - Omni-directional wheels ordered and arrived. Maxon motors and encoders ordered. July 2004 - Maxon motors and encoders arrived.